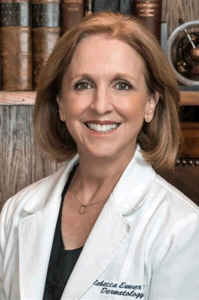 Board certified Dermatologist, Dr. Rebecca Euwer,has been practicing in Dallas since 1991. Dr Euwer has been recognized as one of the Best Doctors in America, one of the Best Doctors in D Magazine, and a Texas Super Doctor in Texas Monthly. Dr Euwer specializes in cosmetic dermatology and is a Clinical Professor at University of Texas Southwestern. She teaches cosmetic dermatology at UTSW and Baylor University Medical Center. She has lectured and trained physicians locally and nationally on cosmetic procedures in Dermatology. Dr Euwer specializes in improving facial appearance by using techniques that give natural looking results, involve minimal to no recovery, and are long lasting. She uses a combination of products to restore fullness to the face and relax lines and wrinkles. Restoring fullness to the face is often referred to as a ‘liquid face lift”. It can be done in the office without anesthesia and is very safe. Dr Euwer received her medical degree from University of Colorado Medical School. In Dallas, Texas she completed her internship at Baylor University Medical Center and her Dermatology residency at Parkland where she was named Chief Resident. She is past President of the Texas Dermatological Society and the Dallas Dermatological Society. Dr Euwer believes in giving back to her community and volunteers her time providing dermatological care for uninsured patients at CitySquare Clinic, removes tattoos from young people who want to get out of gangs or join the military and participates annually in free skin cancer screening.